Dreams DO come true! I have been creating my entire life- and to share those talents with others truly is a JOY! We developed our workshop(s) to do just that. I create a lot of things, but my most sought-after skill is making paper flowers. I love making them as it comes very naturally to me, however since I am frequently overwhelmed with requests/orders, (which is a wonderful problem to have), I made the decision to host a paper flower workshop to teach this skill to those who wanted to learn! 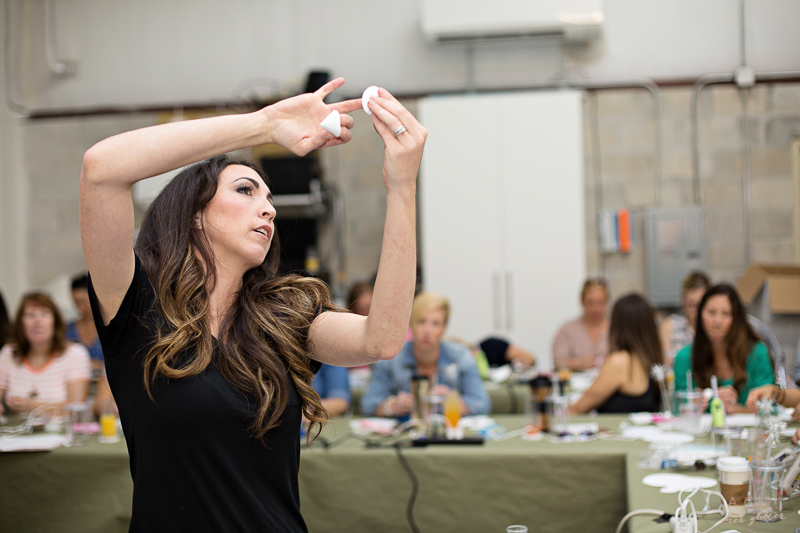 The entire goal of this workshop was to get people together to have a FUN day of creating. I wanted yummy foods, cute and delicious drinks, as well as, sweets and activities. 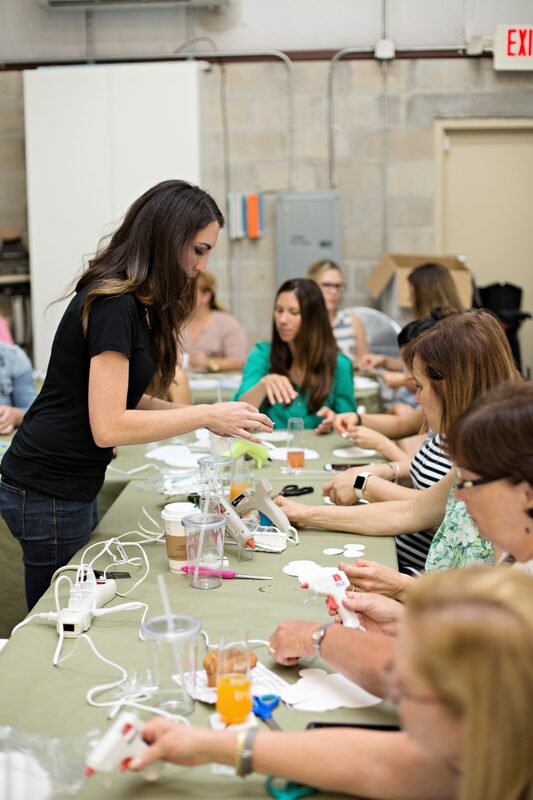 We limited our class to a max of 24 attendees to ensure that we would be able to guide each person through the step by step directions. 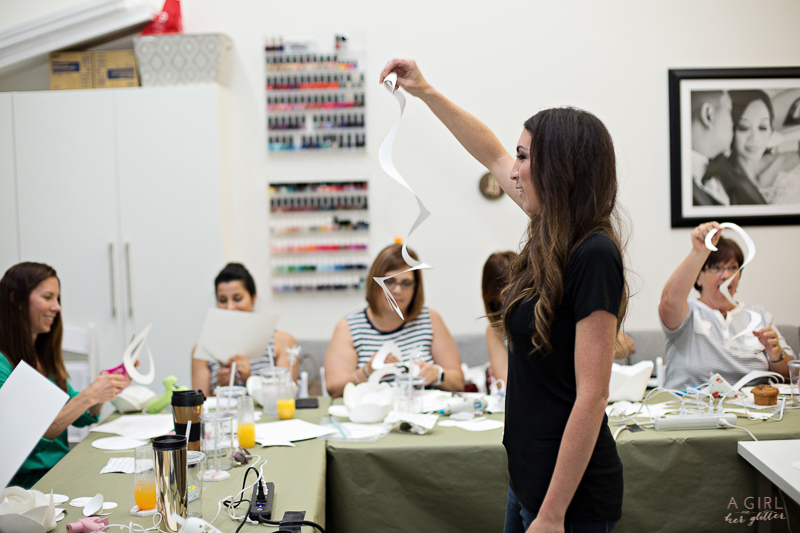 That way we were able to answer questions and work together towards the end result – beautiful paper flowers! You may say I “over did it,” but I think it was perfect! Every single wonderful and fun person that attended not only had a great time, but also left knowing how to make many of my signature flowers! Want to see the action live? Watch behind the scenes action as well as hear what we are all about here. 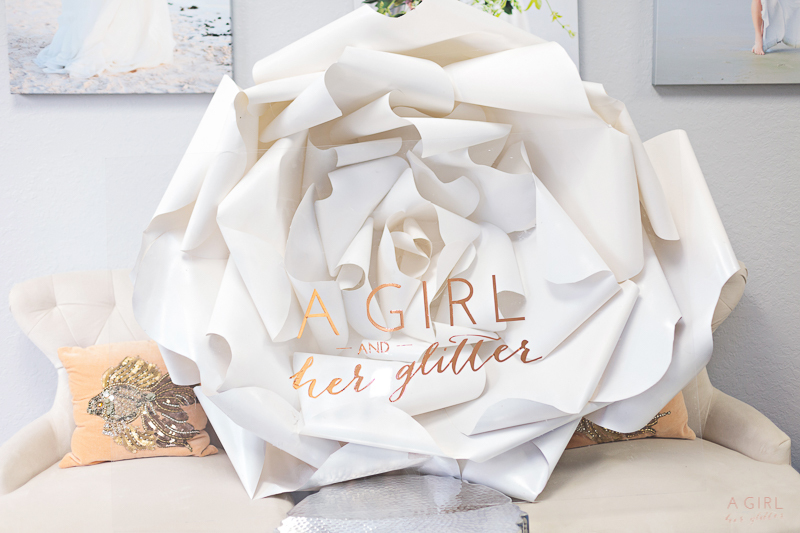 We created this 5′ flower to greet guests- and show them what the possibilities could be. I added my logo by using my Cricut and their bronze vinyl- laid it onto the plexiglass- then leaned the plexi glass onto the flower. Our beverage bar had mimosas and iced coffees. We used our beverage containers but added vinyl directly onto the glass with the type of juice that was inside. The sparkler stir sticks were a hit and the tutorial can be found here. 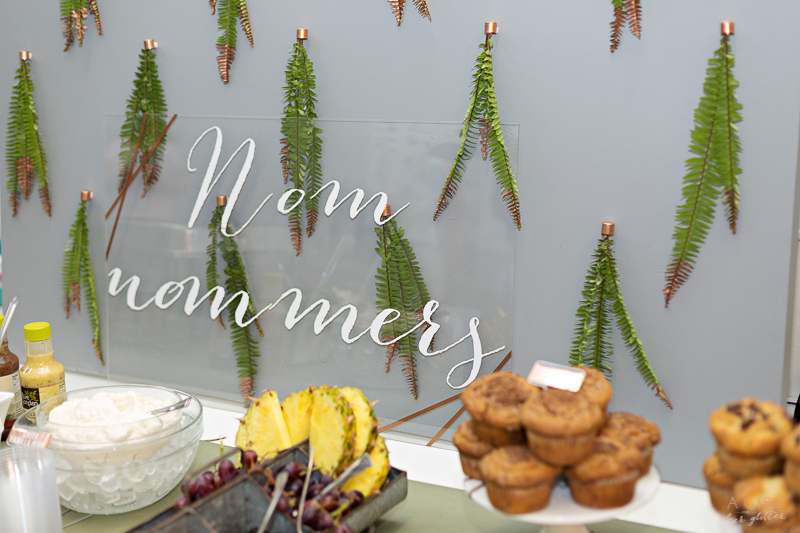 We used the same technique as the giant flower logo- here with the playful “nom nommers.” We used a canvas from Michaels and add copper caps- placed three painted ferns in them and attached to the canvas. I wanted to give the board dimension and loved how the colors turned out. 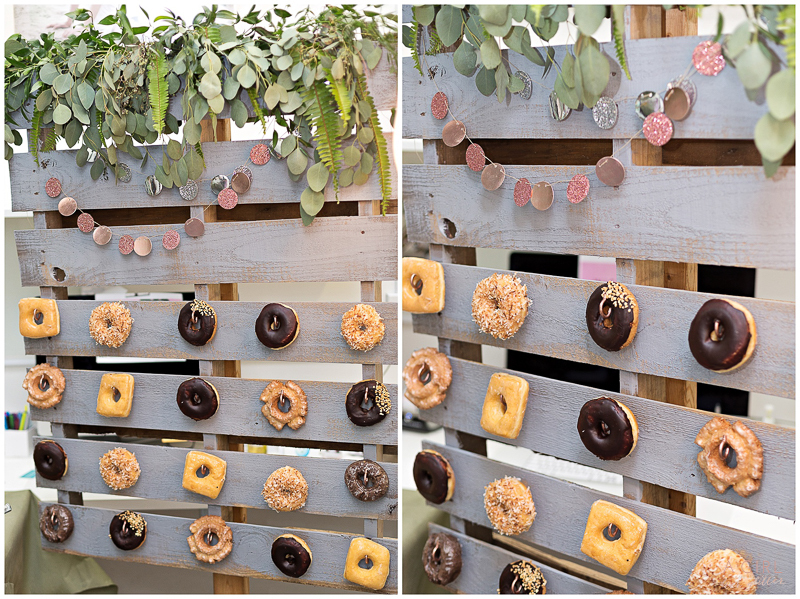 The ever AWESOME donut wall! I wanted to soften the pallet up by using gray paint- adding rose gold hooks/ two banners that I scored in the $1 section at target- and topped it off with overflowing eucalyptus and ferns. These donuts are from a local shop where I live and are THE best. Time to start the class! Michaels was a wonderful support to our workshop. 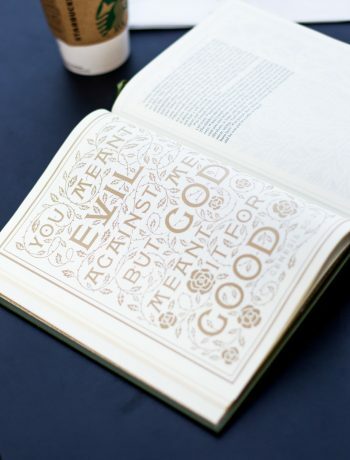 We love this creative supply store and were grateful to have them there. 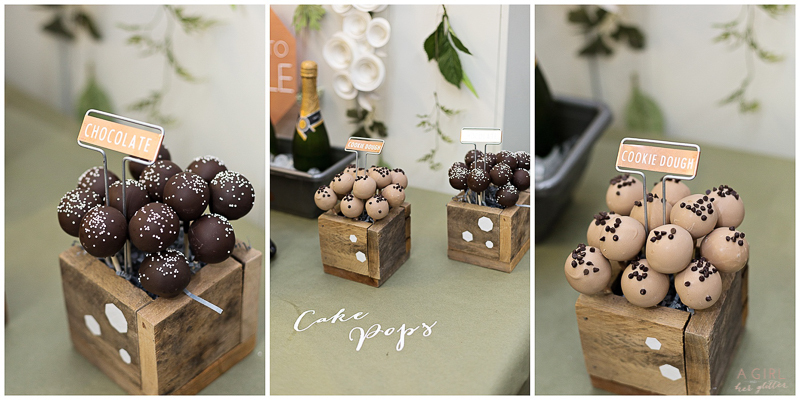 A sugar break was needed before the last flower- and I just can’t get over Starbucks and their delicious cake pops! The colors were perfect and of course— so scrumptious! The open air photo booth from Flash by KWP was a highlight for me. 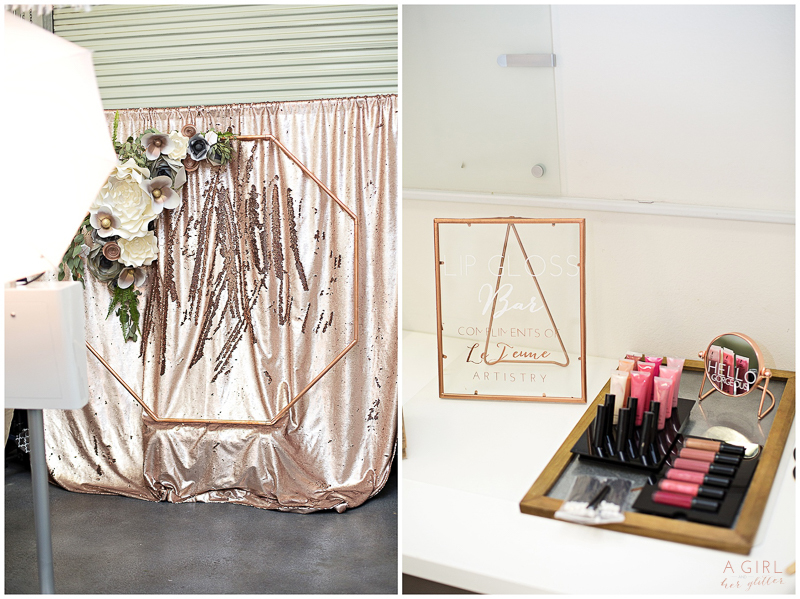 I just love the set up and LeJeune Artistry provided their line of lip colors/stains and glosses for attendees to try on before getting camera ready! The workshop was so fun. 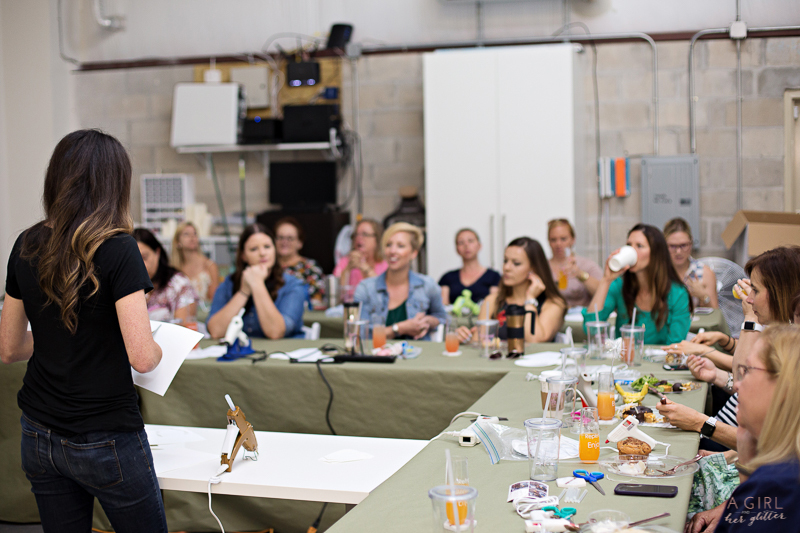 Loved learning how to create amazing flowers and just hanging with some awesome ladies! !